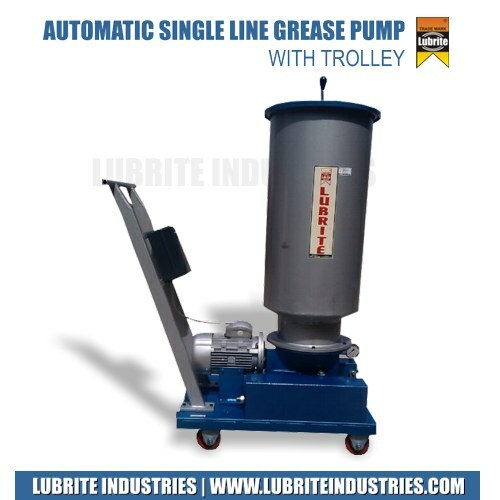 Lubrite Industries is an exclusive manufacturer and exporters of Motorised Grease Lubrication Pumps from India. We manufacture Centralised Lubrication Systems. 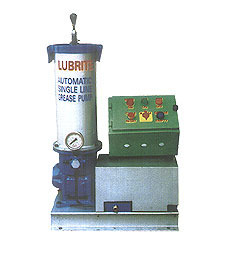 Lubrite Automatic Single Line Grease Pump consists of Reciprocating Motor Driven Plunger Pump with in built Gear Box. The Pump incorporate a large grease reservoir with a follower plate & tell tale rod. 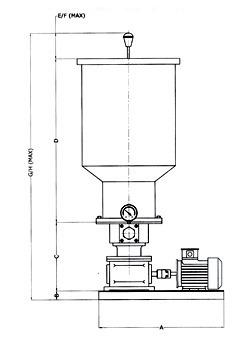 Limit Switch is provided on the top of the reservoir to indicate full and empty level of grease. The pump outlet is connected to Pressure Relief Valve. Bleed Valve is provided on the pump body to bleed air entrapped in the system. Before operating the pump, Bleed Valve is kept open till the continue flow of grease starts from it. The whole system is controlled with Electric Control Panel. Working Pressure 100 kg/sq.cm. 200 kg/sq.cm.